International choreographic contest “INTERNATIONAL DANCE GAMES” ®. The idea of holding such contest as International Dance Games is caused by the Olympic ideal of competitiveness in a fair contest of dance groups from all over the world. This idea should inspire people to feel the spirit of the event, regardless of the artistic level of their performances. The main idea of our events is to motivate young dancers to make their dreams come true, to show the public what they are capable of, to demonstrate art to the spectators and to give the group leaders a possibility to exchange experiences. The idea of International dance games is expressed in the experience of millions of people from all over the world, in the promotion of peace, friendship, fraternal relationships and solidarity of nations through the art of dance, rich traditions and national standards of self expression and communication. Through the language of art people from different countries meet and exchange the most sacred things – works of cultural and artistic expression. Regularly choreographic groups from different countries meet on the International Dance Games to make a contribution to the matter of peace and mutual understanding among people from all over the world. And all together they celebrate a grand holiday of dance as it’s a common language for people from all over the world. 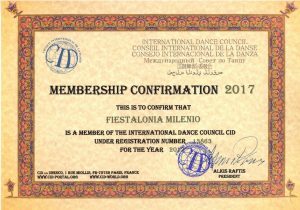 Fiestalonia Milenio is a constant member of CID UNESCO / The dance council under UNESCO. The contest is held once a year moving from one country to another. In the application, it’s necessary to specify if the layout of performances is needed or if the work will be executed by one set. Due to the organizational issues and for providing optimal conditions for the participants, participation in the contest is allowed only in case if the whole services pack including accommodation of the participants is booked directly via the booking department of Fiestalonia Milenio or via the travel agencies we collaborate with. It is an obligatory condition, therefore it’s a part of the Participation conditions. Professors, associate professors and leading tutors of world’s higher cultural educational establishments, and famous critics. The jury of the contest is formed of the most important cultural workers of Spain, France, Canada and other countries of the Eastern Europe and Asia. International jury is formed by the contest’s providers. Participation in the gala concert isn’t guaranteed for everyone and is confirmed due to the results of the previous shows according to the consolidated legislative decision of the contest providers and the judges. participants who received 100 points become winners of the grand prize of the contest “INTERNATIONAL DANCE GAMES” (platinum diploma). 21:00 – a visit to a flamenco show with vine, sangria, champagne, and other drinks (for an additional charge). 20:30 – the beginning of the gala concert of the winners and giving out the awards. * ATTENTION! Organizers have the opportunity to modify the program.